Generally such models live only in prototypes and are created to amuse public, to intrigue investors, to surprise professionals, to decorate the demonstration stand in any large exhibition such as CeBIT. The subsequent destiny of similar development is unenviable - model lies down in table or case, and its place on the conveyor borrows something more democratic, compact, and less equipped. Also remains, as in that joke, only sediment … In a case with Sony it is not so. I do not know, what monsters are born in research laboratories of the company, but, after a sight at novelties of the company, starts to seem, that the most courageous design ideas go straight in the multitude. 8. The documentation on CD, as usually. Rather pleasant set for domestic photographic studio! The cable for connection of all this goods to TV has especially pleased: I have no idea, how users of handheld computers did spare without it earlier??? 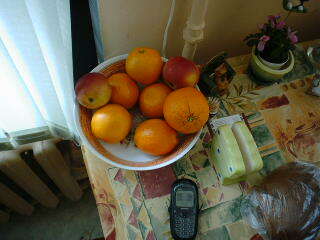 And if to speak seriously, in the standard complete set there is practically everything that can be necessary for user. To buy it will necessary unless separate portable charger, but it's on the fan. It does not suffice unless memory card, but such luxury complete with a handheld computer is represented by nobody. It is big - the first impression from this pocket computer which I have formulated! And then still - heavy. Big so, that you will not put it in a pocket any more - its place is in a bag. The top part - that with the camera is in one and a half time wider than other case, this is the payment for serious resolution of the camera. 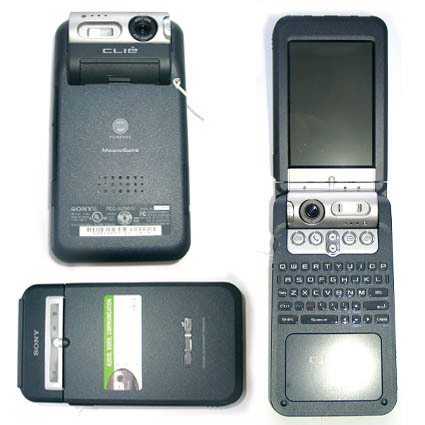 Computer is matte-black with three silver inserts: one is the module of the camera - the rotary mechanism, the second - a platform with standard set of Palm hardware buttons, and the third - the panel with 3 LEDs - Bluetooth, MemoryStick and a bulb responsible for indication of working condition of the handheld computer and the charge of accumulator. 1) LED indicators on the external panel. 2) They are on the internal too. It seems, that Japanese, having stuffed the new device with such amount of functions and having been frightened, that it can be frivolously considered, came to design with the responsibility: the similar black parallelepiped in hands can inspire only respect and reverential trembling. In principle, certainly, the basic idea - the displayed case is old enough and has had time to bother this is already the third series of handheld computer in the similar case, but a certain validity of all design as a whole has appeared for the first time. Even the built-in keyboard, despite of still small size became not as an example more convenient, in comparison with that was in the previous models. 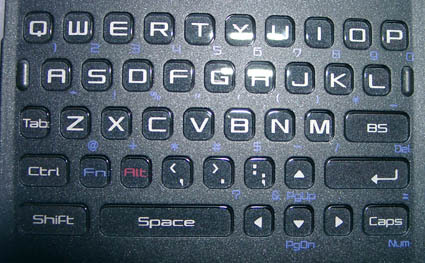 If earlier the role of the keyboard was played by a transparent label with hardly acting buttons, now each button sits in made specially for it aperture in the case of the handheld computer, keys became wider, has appeared, though also a small but appreciable vertical motion. Letters are put on keys precisely, figures and special symbols - atop, it is not clear from what reasons, with violet color. Taking into account, that background on which all this is printed - black, to make out similar badges it is rather problematic. Has disappointed only the stylus to which, probably, did not have place inside the device and it have defined on one of the face parts of the screen. (The Similar design already, is remembered, used in Vizor Edge handheld computer, but has not won popularity as it was too inconvenient for the user.) And even in spite of the fact that it keeps there well, it is necessary to have doubtless dexterity and the certain skill for getting and inserting stylus on their place without problems. There are plenty of them in this devie. If you like switch different buttons, slots and so, this model is really for you. All details are thought out and made with Japanese quality and love. All keys can be pressed even by tiny fingures. 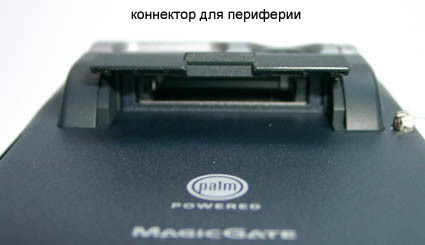 A power on key is placed on the left part of the PDA. To find it you need some practice, it's not easilty to say tht truth. The device key can't be automatically switched on, as the power key is slided, not really pressed. The same construction was used in Newton MessagePad. But let's turn to other buttons. 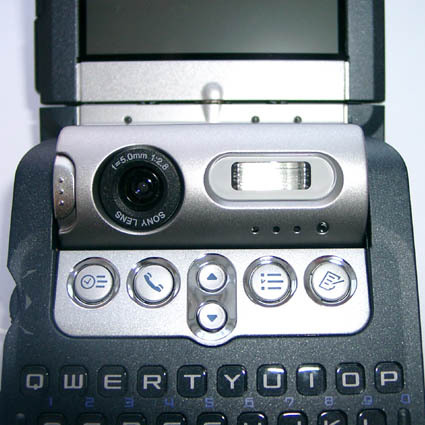 On the right-hand side one can see a MemoryStick slot, which is positioned under power key and covered by an elegant shutter; a Hold key - used to lock keyboard if you use remote control, battery cover, headphone jack with a special hole to connect remote control and Capture button - camera lens shutter button. Now few words about the left-hand side: «Reset», «Voice REC» – internal dictaphone activation, standard «JogDial» module (including "Back" key) and IrDA. There is also one more screwed cover here. If we open it, we can find a reserved re-chargable battery under it. It's a pleasant surprise for customers. - the mentioned Backup-battery cover. Standard hardware Palm buttons on NZ-90 model look a certain atavism. First, they are not too convenient for using, second, a part of functions with success has undertaken by "JogDial". But I have been very much surprised founding (to a word, it is far from being at once) repeaters of the hardware buttons at the external end face of the screen! 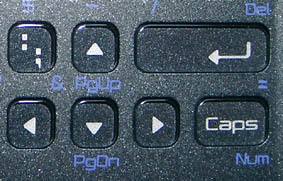 Buttons are not the most convenient, but they are and now start of main applications is accessible and from "nonkeyboard" states of the handheld computer. 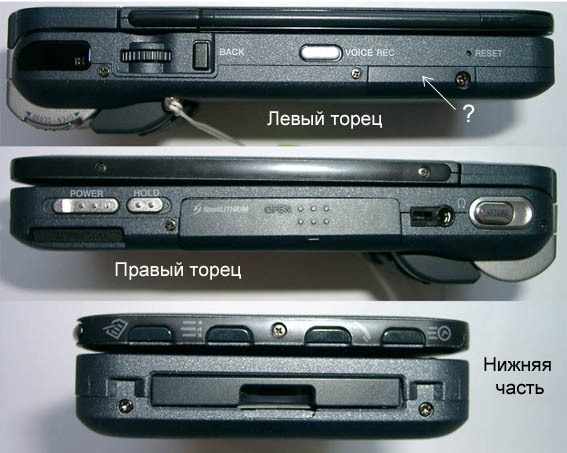 Also, has pleased the possibility to close an objective of the camera with shutter: to be sure, it as against the previous turning models, where the lens could be hidden inside the handheld computer, practically is protected by nothing. Separately and once again it is necessary to tell some warm words about the keyboard. That is, certainly, up to that "luxury" that was in Psion models , it is far from it, but, undoubtedly, it is already better than that was in NR and NX series , anyway, this keyboard can be used rather successfully to type even small texts. In some review, I liked the analogy which has been carried out between this keyboard and plastic bubbles of packing material - it is similar on sound and sensations. There is also an open space for russification - I hope it will shortly appear - I mean free space above keys, for characters of the Russian alphabet. The universal connector now is transferred on the back part of the device that is unusual to standard Palm construction. The connector is identical to the plugs used in NX and NR series and is closed by small plastic cap, fastened to tank. The interesting construction, which for the first time has been thought over to be user-friendly. First, it's collapsible, and in the combined state it is plane enough and small thing which can be defined in diplomat or road bag. 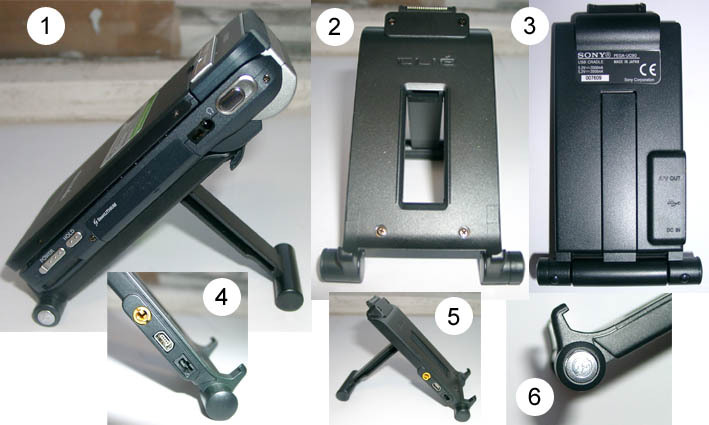 In the decomposed state it is a tripod, on one of which legs - outputs for connection of the charger, USB-cable and video cable. Actually, such amount of the wires connected to a shaky construction is not the best solution, but nobody offers other:-(. The button of synchronization is located and it is at all unusual - on the bottom of one of the "legs" - interesting constructive solution. 1) View of the handheld computer in cradle. 2) Cradle in the decomposed state - the front view. 3) Cradle in the combined state - the top view. 4) Ports for connection (from top to down) of video cable, USB cable, the adapter of power supply. 5) Cradle in the decomposed state - a side view. 6) HotSync button located in the "leg". Clie NZ90 model works on the Intel XScale PXA-250 processor, frequency 200 MHz; it is the same processor that was used in previous NX70 model. It's quite suffices for processing multimedia tasks. The biggest miss of the designers of this handheld computer became the memory size - only 16 megabytes. Thus it is necessary to take into account, that to the user it is accessible only 11, - 1 megabyte is reserved for the system, and 4 - for difficult applications. For Hi-End pocket computer such as NZ90 the similar memory size is simply inadmissible. In my opinion I would consider an optimal size of memory 64 megabytes … In view of it it’s twice pleasantly, that NZ90 can work with MemoryStick PRO cards, up to gigabyte size. The display, as well as for the majority of Sony models is very good! Resolution 320 on 480 pixels, back illumination makes it the best display in the market of pocket computers. Sony's audio possibilities are too at height. To a standard mp3-player, has increased also a dictaphone. In package, there are headphones with remote control, without fail. The console is three-buttoned - without excesses, stylishly and with taste. 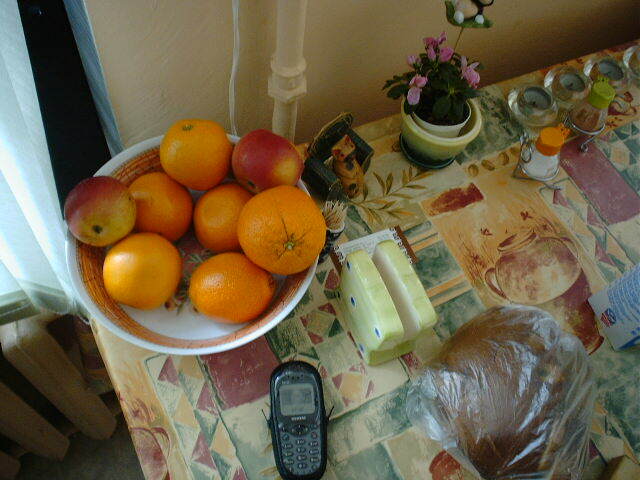 I won't tell, that the mp3-player was the most economic - for me the battery has sufficed only for 4 hours of music listening. 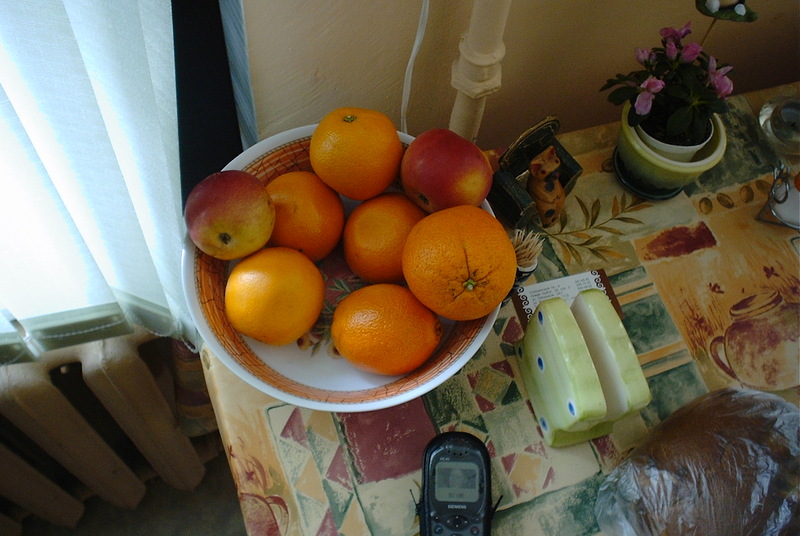 The IR-port as it was led already, however, for a long time, is strengthened; in relation to average handheld computer Palm and NZ90 can work as a control panel of home appliances for what there is a special supplement - ClieRemote. NZ90 - the first pocket computer with built-in Bluetooth-unit. I did not have peripherals near at hand, but, for example, with Palm Tungsten the handheld computer communicated quietly, transferring files, notes, contacts … it is much more convenient, than through the IR-port, it would be desirable to hope, that henceforth this unit step-by-step will substitute (as soon as possible) the IR-port in pocket computers. Deserves to be allocated in the separate paragraph. 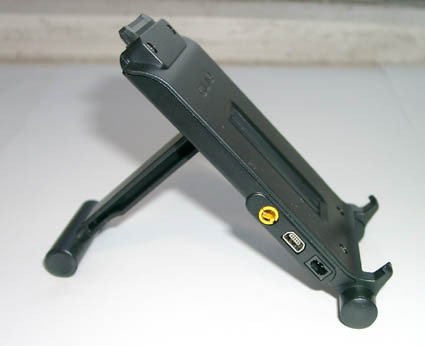 For the first time in NZ90 model Sony used the changeable battery made on InfoLitium technology. The microchip which has been built in the accumulator informs an exact state of the accumulator: how much time is remained before complete discharge or charging of the accumulator. This technology, in particular, watches amount of charging cycles of the accumulator and watches its aging. Is insulting only, that even batteries in capacity of 1200 mAh do not suffice for normal operation of this handheld computer: additional charge is required daily. And if you really want to use the camera frequently and for hours, it is necessary to think about acquisition of the additional accumulator which costs in area of $80. It is interesting, that at discharge of the accumulator some functions start to be disabled. So, for example, at 35 % it is impossible to use flash, and at 30 % the camera is disabled, at 20 % - Bluetooth. Frequently, after dense operation with the camera the charge of the accumulator falls strongly, so, that the camera can be disabled at all, but if to give the computer to have a rest, it again reaches the 70-80 % of charge. Basically, in ordinary use of handheld computer it should suffice at 6-7 hours, on the manufacturer's statement. For me has failed to hold on more than 3 hours … to tell the truth, I was choosy enough user. Besides, deserves the separate paragraph in our review. The 2 mega pixel miracle, which has been built-in by designers in NZ90, is capable to make a decent competition to usual digital cameras. 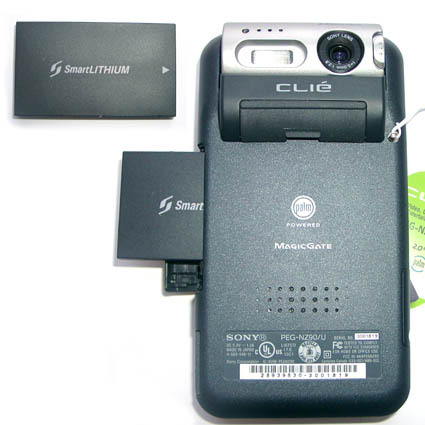 Let's start with that, it is the first digital camera with flash, built-in a pocket computer. 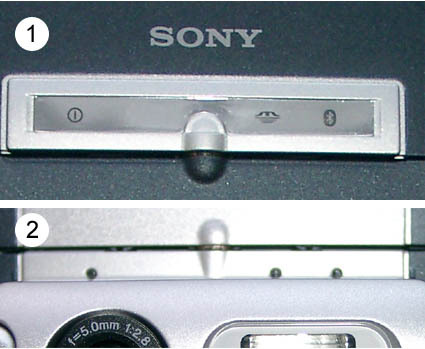 The camera uses a CDD-matrix and lenses of Sony production. It is possible to make pictures in sizes from 320x240 up to 1600x1200; the double digital zoom is also accessible. The amount of customizations is also quite satisfactory: it is possible to use several filters, to setup balance of white and compensation of exposition, to setup the quality of photo, to setup the flash mode, down to correction of the red eyes effect. The focal length of the objective is from 0.1 meters to indefinitely, that is practically the standard for average "soap tray" and allows making quite decent pictures. There is also a macro-mode, for shooting fine subjects from close distance. The separate view-finder is not present - its functions lay entirely on the handheld computer display. 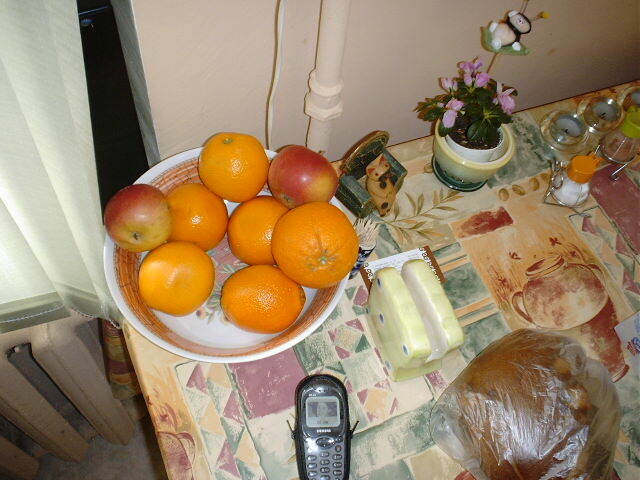 Photos can be saved both in internal memory of the handheld computer and on MemoryStick card. Separate thank is possible to tell to software developers - handle of the camera is at height: customizations can be changed simply "hurriedly", three last photos are displayed in the bottom of the view-finder window, the complete picture album is accessible by one button pressing … Plus to everything, Sony has worked out its own software interface, more difficult, than "native" Palm’s, so, some time is required to get used to unfamiliar icons. Quality of photos is very good, for me there were no claims to this. 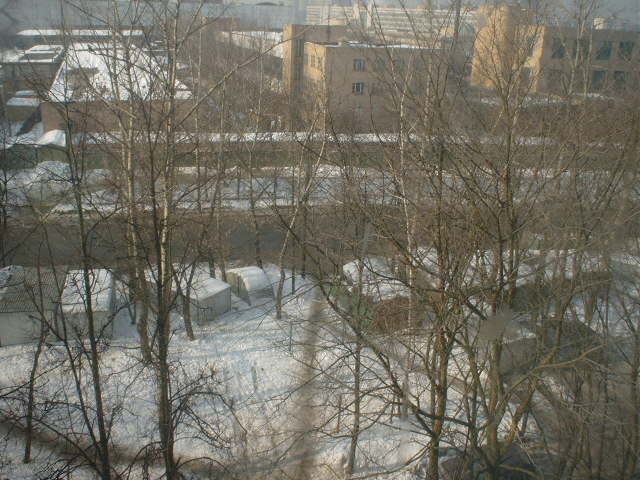 There are links to photos: 320х240, 640x480, 640x480 with flash, 1600x1072 and a photo of nature. Besides the camera can shoot short video clips with sound, the truth, rather average quality - 160x112 points. Basically, it is pleasant, but I did not find the real use of this function. Plus to all video is rather willingly eats memory, which Sony has not enough. I had a double impression about this machine: on the one hand it is, certainly the celebration of high technologies, and NZ90 have no competitors in the market of handheld computer, on the other hand, the device does not hold out up in many respects to a thing with which it is possible to work productively day by day . Affects both the size and disadvantages of the battery and weight, so from myself I would tell so - to take in hands it’s reasonably interestingly, but to myself I would not take such piece. Though, probably, Sony fans will not agree with me….